The Sarjeant Gallery Collection is a fantastic resource for schools and is accessible both online and in real, three-dimensional time. While art is a subject in its own right, artworks can facilitate learning across many different areas of the school curriculum including English, history and social sciences – and international students learn a lot about how to use descriptive language when discussing art. For over twenty years the Gallery’s Education Program has been funded by the Ministry of Education’s ‘Learning Experiences outside the Classroom’ initiative and the Whanganui District Council, and therefore is currently a free resource for primary and secondary schools. In the education room at Sarjeant on the Quay, Education Officer, Sietska Jansma is doing a test run of clay tiles as she plans to teach children how to create their own tiles, drawing inspiration from their study of the sea when they visited Castlecliff Beach. Ms Jansma started the year working with Kelburn Normal School from Wellington during their camp in Whanganui. 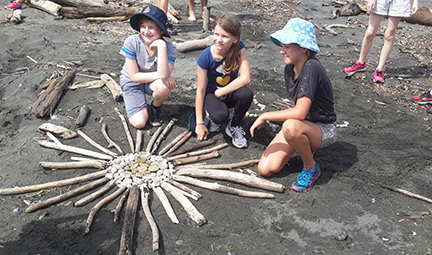 As part of their program, the students made charcoal drawings using photographs by John Beard and Anne Noble as stimuli, and Ms Jansma worked with the students at Mowhanau Beach creating artworks that responded to that environment. That session was a partnership between Sarjeant Gallery, Whanganui Regional Museum, Department of Conservation and Horizons Regional Council – all of whom provide educational experiences during the annual Sea Week in March. The current Sarjeant on the Quay exhibition Clouds (17 February-27 May 2018) is in excellent example of the diversity of the Gallery’s permanent collection and recently it allowed a group of young students the chance to view the many different ways that artists might depict the sky. “We talked about the mood of the clouds, whether they were stormy or peaceful, the time of day and asked did they ever lie on the ground and look at the sky and notice the way clouds move” After Ms Jansma showed them how to mix and blend colours they painted their own sky and added silhouetted landscapes. Works from the Sarjeant’s collection can be brought out on a specially built rack which gives students a chance to view important and delicate works up close. The Gallery’s prize winning Explore the Collection online portal that is accessible via the Sarjeant website is a great resource which can back up school visits, allowing ongoing discussions and functioning as a virtual gallery in the classroom. Using the Explore the Collection portal – a search for “sea” brings up 189 works listed with the artists name, nationality, dates, predominant colours and more. Using the Explore the Collection portal the Sarjeant Collection can be ‘sliced and diced’ in many different ways. Teachers can also use the portal to choose works they would like to see in person and email Ms Jansma to set up a class visit and viewing.